A powered exoskeleton is a mobile machine which consisting of primarily an outer framework worn by a person. 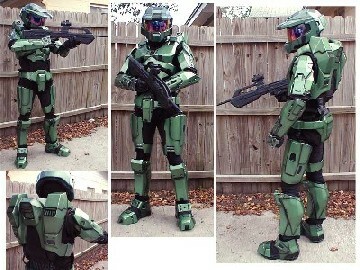 It is also known as powered armor, exoframe, or exosuit. It is powered by a system of motors or by hydraulics. It assist the wearer by boosting their strength and endurance. They are designed commonly for military use. They help the soldiers to carry heavy loads both in and out of combat. They are also used in civilian areas as to help fire fighters and other rescue workers to survive in dangerous environments. The medical field also uses this exoskeleton technology where they are used as to allow nurses to move heavy patients and to help in surgery.Panasonic is about to launch its first mass-produced robotic exoskeleton for about $50,000.This full-body power garment will let you hoist 220-pound (or about 99.7903 kg) objects and move at speeds up to 5 mph. The US Army recently put out their proposals to build a futuristic climate controlled powered exoskeleton that would make soldiers smarter, stronger, and tougher. They are trying to create their imaginations like Iron Man.The exoskeleton won’t fly, it won’t have a friendly AI chatting away in a soldier’s ear, it won’t have a miniature Arc Reactor delivering heat free power equivalent to a nuclear sub but it is yet just a concept but concepts won't take too much time to build them in reality. The defence technology developer Lockheed Martin leads the efforts to develop a exoskeleton fit for the battlefield with its Human Universal Load Carrier (HULC). The aim of the system is to divert up to 200 lbs in weight through powered titanium legs and allow the user to move freely.These robotic suits or powered exoskeletons, are now so sophisticated and durable that they have reached the point where the US military is considering deploying them for soldiers in war zones. There are now three companies, at least, developing exoskeletons for commercial use and they focus on creating them to help people with spinal injuries. A Swedish company named Ekso Bionics makes an exoskeleton weighting up to 20kg, titanium and aluminium suit that costs $100,000, which has helped several crippled individuals walk again for the first time. But there is need for cheaper exoskeletons for more general use, they are also on the way. 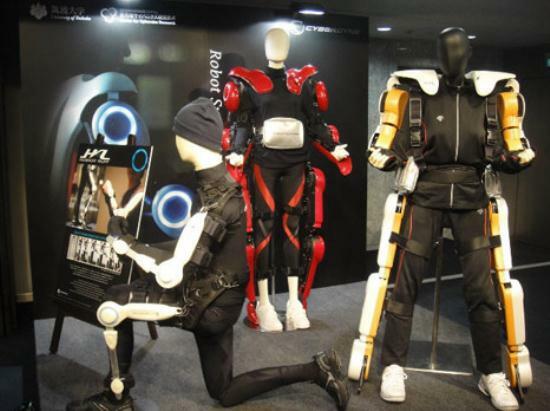 Japanese company, Cyberdyne has developed a wearable robot suit it has christened HAL, which is for many non military uses like in emergency rescue personnel who required to rescue people from under collapsed buildings The HAL suit works by detecting signals sent from the brain to muscles and amplifies them. The United States government had expressed interest in purchasing HAL suits this was announced during the 2011 Consumer Electronics Show. 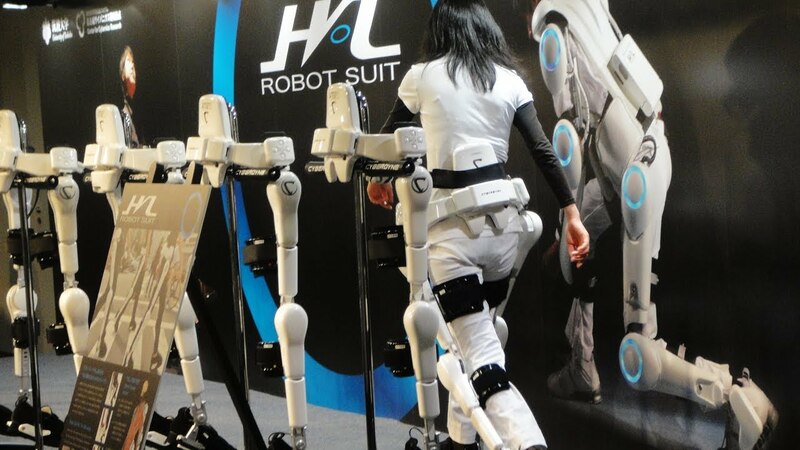 In March 2011, Cyberdyne presented a legs only HAL version for the health care professionals and factory workers.HAL was selected to be used for clean up work at the site of the Fukushima nuclear accident, in November 2011. It is based on the mechanics of nerve signals. When a person attempts to move their body the nerve signals are sent from the brain to the muscles through the motor neurons, the small biosignals can be detected on the surface of the skin. The HAL suit registers these signals through a sensor attached to the skin of the wearer. It is Based on the signals obtained. The HAL suit possesses a cybernic control system consisting of both a user activated voluntary control system named Cybernic Voluntary Control (CVC) and a robotic autonomous control system basically named Cybernic Autonomous Control (CAC), for automatic motion support. Did you think about picking the #1 Bitcoin exchange company: YoBit.